In 2000, Slovenia participated, at the highest level, in the Stockholm Conference and remains fully committed to upholding the Stockholm Declaration on Holocaust Education, Remembrance and Research. On 1 December 2011, Slovenia became a full member of the IHRA, which resulted in an increased interest in the research on the Holocaust. The memory of the suffering of the Slovenian people during the German, Italian and Hungarian occupation in the Second World War remains. In the period from 1941 to 1945, an estimated 6.6% of the population lost their lives due to war and occupation. Out of a population of about 1.5 million in 1941, over 61,600 were sent to the Fascist and Nazi concentration camps, mostly to Dachau, Mauthausen, Auschwitz and the Fascist camp on the island of Rab. 10,190 of them never returned. A research of the effects of the Second World War on the Jewish population on the Slovenian territory showed that around 87% of Slovenian Jews lost their lives in the Shoah. According to research, which has still not been completed, there were 569 Jewish victims, 72 of them underage (35 children under 6 years). Out of 501 that were killed in the concentration camps, 439 died in Nazi concentration camp Auschwitz. The decimated Jewish population was further reduced after the war as numerous survivors decided to emigrate due to the post-war political climate in the then-Yugoslavia. General teaching about the Holocaust is included in the history curricula in both primary (compulsory) and secondary education. Through the events both before and during the Second World War, Slovenian pupils are taught about the fate of Jews in Nazi Germany and other European countries in which the Holocaust took place. In 2008, the Government designated 27 January as national Holocaust Remembrance Day. 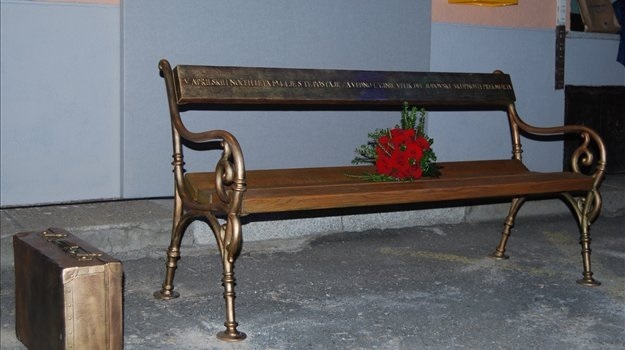 On the occasion of the national Holocaust Remembrance Day in 2010, the first memorial to the victims of the Holocaust in Slovenia entitled "Forgotten Suitcase" was unveiled at the railway station in Murska Sobota, as this was the first station of their journey to Auschwitz for most Jewish families from the regional capital. The installation was organised by the Research Centre of the Slovenian Academy of Sciences and Arts. The research of the effects of the Holocaust on the Jewish population on the Slovenian territory is still incomplete. Some attempts have also been made to look into the issue of the genocide of Roma.